Any and all of our baskets can be personalized for any and every occasion. If you want one of our baskets to be for a special birthday or holiday just say so. We will add a special touch for that special day. You name it we can create it....Just let us know what you are looking for. Housewarming basket comes with 2 coffee mugs, instant coffee & tea. An assortment of kitchen utensils such as pot holders, towels and much more. A great gift at a great price. This "Thank You" basket will make them feel extra special. Equipped with the best candies, candles, cheeses and much more. A million dollar feeling. For that special someone or couple going on a special trip. This basket is full of all the essentials that are sometimes forgotten. Suntan lotion, body lotion, travel tooth brush, toothpaste, even a small first aid kit, and much more. Don't let them leave home without this! Full with a variety of pasta and sauces this basket is sure to be a hit. 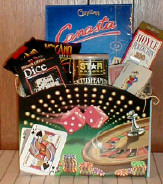 For that special gambler an assortment to make them feel like they are in Vegas. 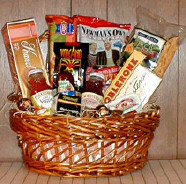 Chocolates, candies and cheeses also compliment this basket. Invite some friends over and watch a game. You'll have everything you need in this basket. From popcorn to chocolates, chips, dip, and more. 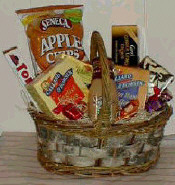 This special basket is sure to make anyone feel better. Filled with more than just get well wishes, they will feel better in no time.